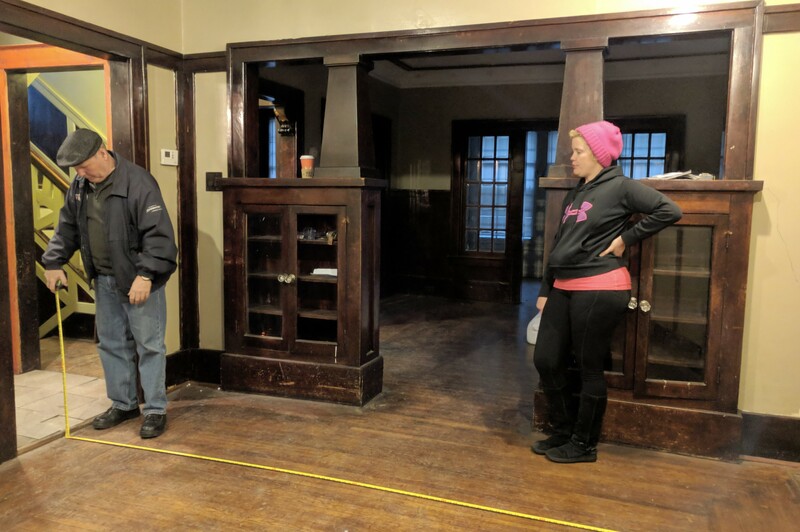 It’s tricky because you want to do the floors before you move anything in, but you also want to make sure you do other work that could damage the floors even further first. So, floors must be somewhere in the middle: We want to do the most destructive work first, and paint, before we get the floors restored. We decided to work with Randy Penhorwood from Penhorwood Floors again. He did an amazing job at the Sullivan House and truly has a passion for old wood floors. He came in, did some floor-whispering, and left excited about the quality of wood, the patterns, and his ability to make things shine again. His quote was extremely reasonable and we didn’t hesitate to say “go for it!”. Schedule is undecided so far, pending how all the other jobs line up. Last month, Nicole found a contest hosted by Motor City Paint in partnership with the Detroit Historical Museum. 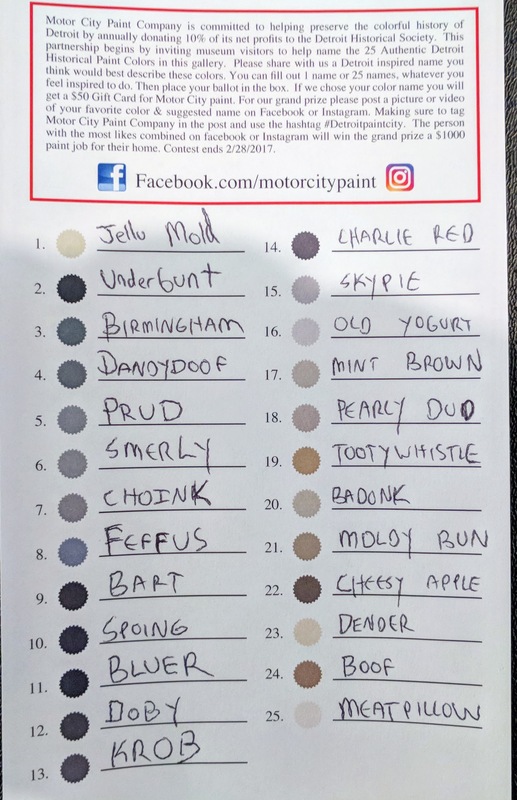 The contest was to name 25 new colors that Motor City Paint was releasing. They are inspired by historically accurate colors of Detroit and are focused on restoration projects like ours. We went to the Historical Museum one cold Saturday afternoon and spent 20 minutes writing down super goofy names because I’m dumb like that. The contest had three components: The person with the most Facebook likes would win a $1000 grand prize house-painting package. 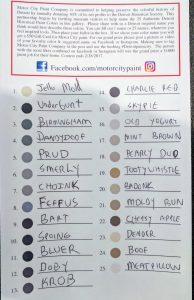 Another $1000 grand prize would be given out to a random person who entered, and then the 25 people whose color name ideas were chosen would each receive a $50 gift card from Motor City Paint. I posted the contest entry on Facebook and shared it with my friends and associates. It was mostly for laughs, as you can see. A month later, I got a Facebook message from Brian, the Motor City Paint guy. We won the “most likes on Facebook” part of the contest. To say that I was shocked is an understatement. As it turns out, the $1000 grand prize is worth far more than that, because the $1000 covers labor: Motor City Paint is providing all the paint for free. What an incredible gift! 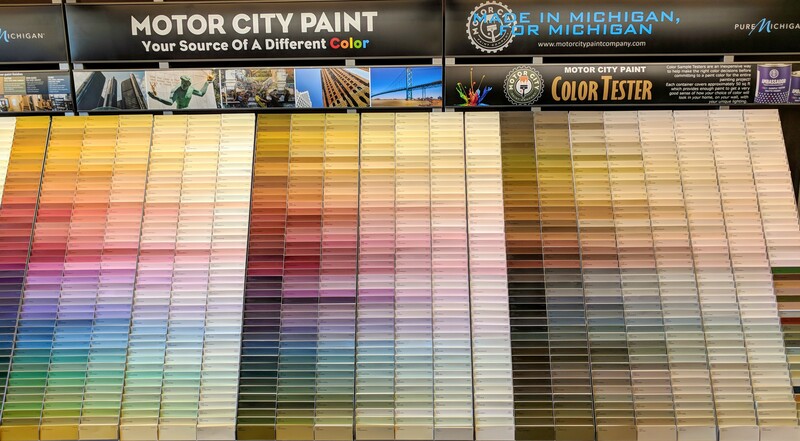 Motor City recommended one of their painting contractors, Lakeside Paint & Plaster. We will be meeting with them shortly to discuss initial work. Since the prize is free labor, we were thinking of getting the more costly and difficult painting done by experts; possibly the hallways, banisters, and stairways as well as the small parts of the exterior that are painted wood. Bedroom and other easier painting is stuff we can do ourselves. We picked up a swatch book from Motor City this past weekend and started the arduous and stressful task of color choices; we have no solid plan yet but whatever colors we choose have to go well with the dark natural wood that already exists in the house. Lincoln had excellent work done by RC Marsack, so we didn’t hesitate to call him back for our own projects. Turns out, this is a big one. The entire front walk, the decorative brick pillars in front, the front porch steps and slabs all need to be repaired or replaced. The chimney needs work, both fireplaces need to be repaired, and the back porch (which is mortared stone) is in significant disrepair. The exterior finish (pebble dash) has cracking and even some gaping holes on all four sides of the house. The main slab of the front walkway is a solid piece of limestone that needs to be canted away from the home (currently it is sunk towards the house, which is great if you want rain to pour towards your foundation, but we’re not like that). Ralph spent a solid hour walking around with a clipboard, discussing various projects with us. We came to the conclusion that the only way to do it is to do it once and do it right. The quote came back and while we were prepared to see a big number, it’s still shocking when it’s right in front of you in black and white. Ralph does good work, though, and for the amount of labor that needs to be done his quote was quite reasonable, so we’re going to proceed. We got a personal recommendation from a trusted neighbor that Dave Munroe from Caledonia Electric was the way to go. The house is currently a (bad) combination of knob-and-tube and some modern wiring, all hooked into a relatively new 150 amp breaker panel. It looks like some work had been done in the last ten years but not all of it. 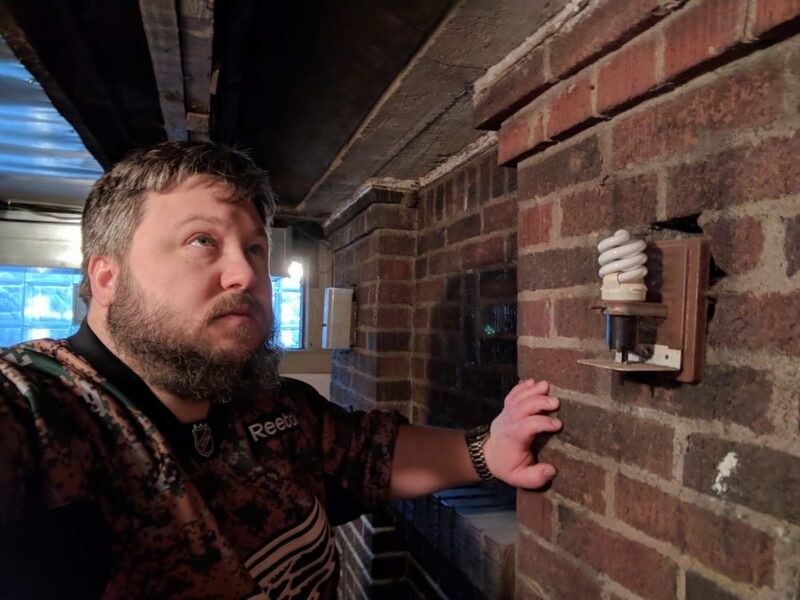 Dave came out for an initial consultation, agreed with our spitball assessment that the electrical system was questionable, and let us know that the first step should be mapping out which breakers control what. We could either pay him to do it or do it ourselves. We opted for the latter. So it was that we ended up on a Saturday afternoon, flipping breaks and yelling across the house at each other. We got most of the breakers identified, but one serious conundrum popped up during our exploration. I was standing in what will become the office; the room off of the main room. Nicole flipped every single breaker, yet the lights never went out. Convinced that either I was being an idiot or she was, I yelled down at her to try again. Same result. I asked her to flip the main. The lights went out. 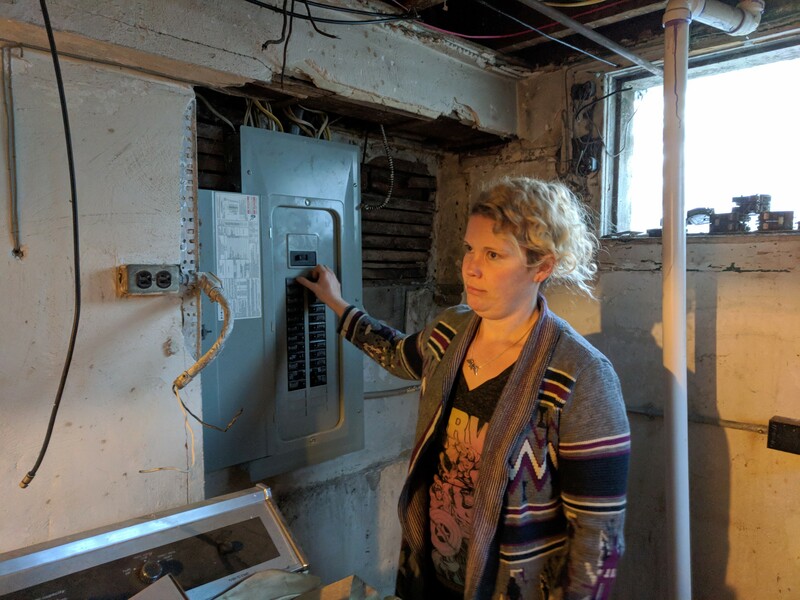 Through a process of elimination and logic-problem solving, we finally discovered that two entirely separate breakers had to be turned off to get the power to cut out… a wiring problem for the ages. Breakers 8 and 12, we hate you. Another problem to be solved is replacing the old 50-gallon water tank with the broken temperature control wheel. We opted to go with the trusted Soley Heating & Cooling. We have an appointment with Kim Soley soon to get a quote on converting to tankless as well as testing the central air unit and making sure the furnace is clean and in good working order. Overall it’s been a busy month, and yet it feels like nothing has been “accomplished”. Kyle, my son, has moved in to be a caretaker of the house while we renovate, and he’s been doing a good job of cleaning up the remnants of past occupants. It feels a bit more “lived in” and we can start to see where one day it will feel like a home… our home… but for now it’s just basically an overwhelming project that is starting to be broken down into one to-do list with expensive quote attached after another. This entry was posted in The LaSalle Gardens House and tagged Electrical, Feelings, Flooring, Renovation by primesuspect. Bookmark the permalink.